Faculty and staff of the United States Sports Academy gathered with Col. John DeWitt and Toys for Tots regional coordinator Shinora Redmond on Friday, 11 December at the Academy. 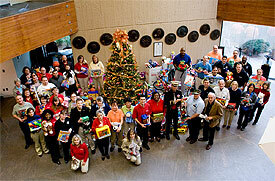 The Academy donated more than 2,000 toys to the cause. The toys will be redistributed to needy children in Baldwin County. People can still drop off toys at the Academy, One Academy Drive in Daphne, throughout the holiday season. The Academy is open from 8 a.m. to 5 p.m.